In a first attempt to streamline my wardrobe, the first step, of course, is a set of staple basics. Everlane offers nothing short of that, so I was incredibly excited to receive a set of my own. I love the versatility of this white, semi-cropped tee, detailed with a breast pocket. I've scoured the racks of Helmut Helmut Lang and even T by Alexander Wang with no luck of attaining the perfect silhouette (since ditching the hi-low hem, that is). So in love with my newest addition! 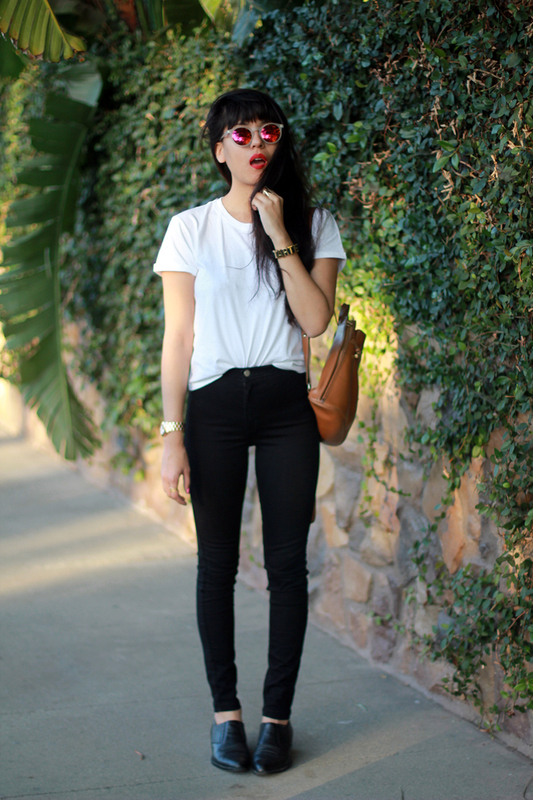 perfect basics! happy valentines day! Ah basics are so important...I used to be so into patterns and craziness but lately I've realized that there's lots of beauty in simplicity as well. You look great here, and you've got me inspired to go on a hunt for the perfect white tee. That is exactly how I feel! Mastering simplicity is definitely something I want to work on more. the outfit looks so urban and cool. loveeeeeee the glasses!